Jim Jarmusch's Only Lovers Left Alive is one of the year's most vibrant films. Jim Jarmusch’s characters move slower than most people we see on screen. They spend time obsessing over Screamin’ Jay Hawkins’ “I Put A Spell on You” or discussing the use of nicotine as an insecticide. They love music and books but not with a glossy pop-culture fandom. They ride around in taxis and old cars at a time of night when few others are awake. Cigarette smoke fills their homes while blues and old rock ‘n’ roll plays in the background. They’re content to lounge on the couch and play records while the world zooms into nothingness. Jarmusch is the right filmmaker to depict vampires who’ve been observing humanity for centuries. The beings in Only Lovers Left Alive recognize cycles of life and won’t exert much energy. It’s best to just enjoy the ride while the human “zombies” destroy the Earth. A prime example is Adam (Tom Hiddleston), who lives alone in an abandoned part of Detroit. He’s surrounded by old photographs of figures like Nikola Tesla, Mark Twain, Billie Holiday, and Johann Sebastian Bach. These former contemporaries are gone while Adam’s life is static. His house includes assorted musical instruments and outdated devices retrofitted to stay functional. His FaceTime with Eve (Tilda Swinton) involves an old cordless phone and an antiquated color TV. Adam’s a genius but avoids society. Music brings solace, yet even that can’t solve his loneliness. The only savior is Eve — his wife across multiple centuries. Her rampant curiosity offsets his dreary perspective, and they just work. Living amid a mass of books in Tangier, Eve grabs her favorites and journeys to Detroit. Once the pair re-connects, it’s difficult to consider them anywhere but right beside each other’s side. Eve (Tilda Swinton) and Adam (Tom Hiddleston) visit the remnants of the Michigan Theatre. It’s intriguing to watch the quiet comfort that Swinton and Hiddleston bring to their characters. She’s several decades older, yet they feel like equals. There’s no hesitation or nervousness between the pair. Eve and Adam are so familiar with each other after centuries that it’s easy to re-connect no matter how long it’s been. 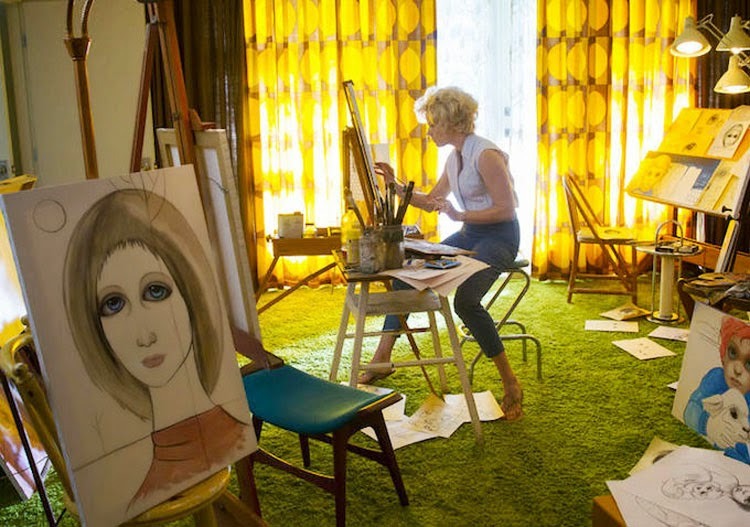 The actors sell this connection with little dialogue, and that’s where Jarmusch’s confidence in the languid style really works. He gives the characters room to breathe, and spending time with them is refreshing. 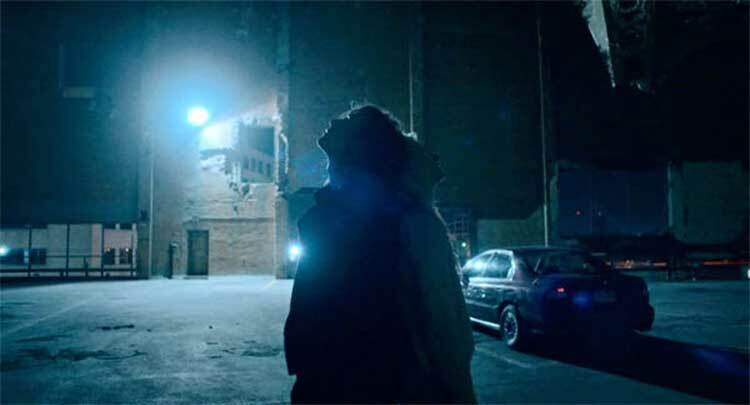 The film’s best sequence has Eve and Adam driving around Detroit and visiting the sights. There’s a wonderful moment at the house where Jack White grew up that epitomizes Jarmusch’s humor. 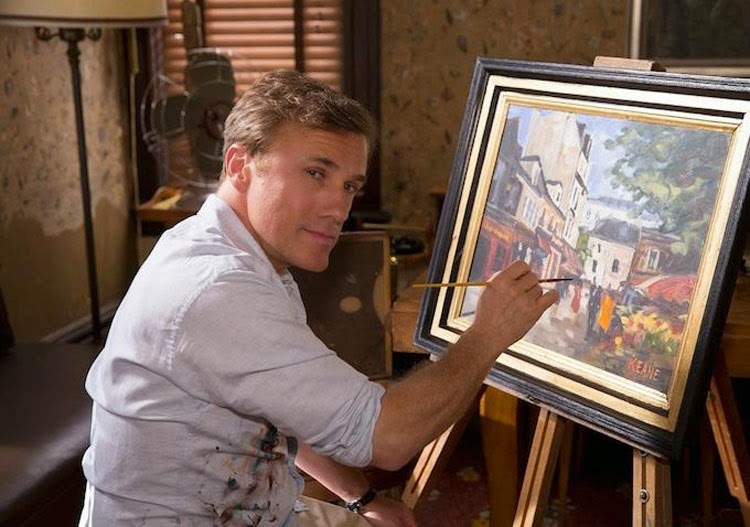 It’s a quick scene yet totally fits with the type of guy the characters would love. The gorgeous Michigan Theatre (now a parking lot) provides a striking setting for pondering what’s been lost. We get the sense that the vampires recognize the impending doom of our decadent society. Even a Jarmusch film sometimes has conflict, and that arrives with the tumultuous Ava (Mia Wasikowska). She’s more like a five-year-old than the wise veterans and acts without thinking. While part of me would have preferred just hanging with Adam and Eve, there’s a clear function to Ava. She reminds them that being a vampire isn’t always so glamourous. Without a supplier of pure blood, it’s difficult to avoid getting contaminated on the streets. It’s clever for Jarmusch to show a different side of the ways we’ve poisoned ourselves and the Earth. Even the vampires don’t want us! Their night out at the rock club shows how cool these night owls remain in that world. Adam is an underground music sensation and barely realizes it, and the trio presents a striking image of hipness to the young club patrons. Those fans are embodied by poor Ian (Anton Yelchin), Adam’s dim-witted connection to the outside world. Eve and Marlowe (John Hurt) don't mind relaxing after living for so many years. Ava leaves while deriding Adam and Eve as “condescending snobs”, and that description is partially accurate. He only drinks the good stuff through his supplier Dr. Watson (an offbeat Jeffrey Wright). She prefers to hang with her pal Marlowe (John Hurt), who wrote Shakespeare’s plays. They’re upper-class vampires that are very particular about their associates. The final act breaks down this façade and reminds Adam and Eve about their true nature. They may prefer to live away from society, but it doesn’t take much to push them back to the streets. The good stuff is gone, and what’s left isn’t so clean. Hints of this real nature come with something as simple as a cut finger by a nearby passenger on the plane. They’re a different type of old-school creature, but the lust for blood still draws them closer to Ava’s approach. What keeps Only Lovers Left Alive from becoming too static are Jarmusch’s stylistic touches, particularly the music. 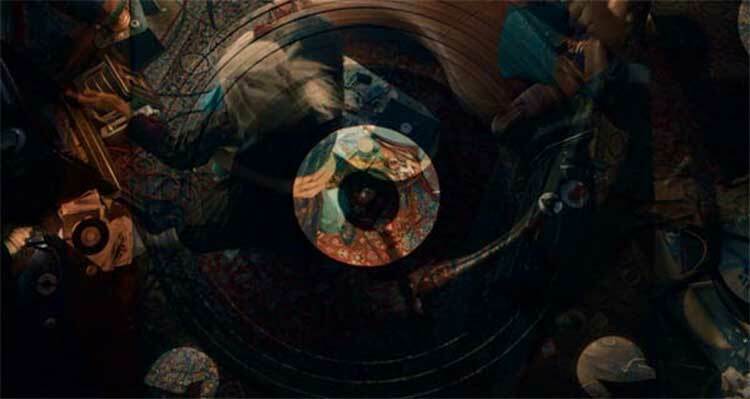 The opening credits appear in front of stars as the image spins in circles and morphs into a record album. Wanda Jackson sings “my head is spinning around and around” and the rooms spin right with it. Shots of Adam and Eve sprawled on their couches are our first looks at them while the circling continues. It’s an evocative way to begin the story that grabs you, and it’s hardly the only example. Another great scene has them listening to Charlie Feathers’ distinctive voice in “Can’t Hardly Stand It” at Adam’s house, and it’s a quintessential Jarmusch moment. His confidence about these characters shines through right to the final shot and delivers one of his best films. 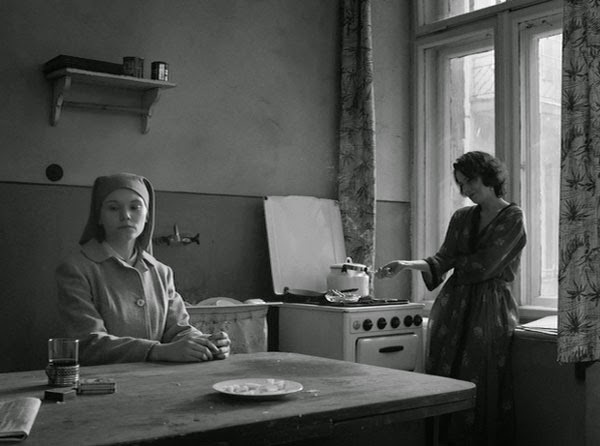 Agata Trzebuchowska and Agata Kulesza in Paweł Pawlikowski's Ida. There’s a grim uncertainty to the Poland People’s Republic of the 1960s that pervades through Paweł Pawlikowski’s Ida. After experiencing the horrors of Nazi occupation, the country fell under Stalinist rule until the late ‘50s when Gomulka took hold. The generations that remember the war and its aftermath still struggle to grasp what happened. Meanwhile, the young adults can live without the emotional turmoil of that experience. They’re becoming artists and musicians inspired more by John Coltrane than painful losses. Living on the sidelines is Anna (Agata Trzebuchowska), a young woman preparing to take her vows as a nun. She travels to meet her aunt Wanda Gruz (Agata Kulesza) to understand her family’s background. Anna was orphaned at a young age, and her Mother Superior requires that she learn about it before the vows. What she discovers connects back to Poland’s darkest times during World War II. The story begins at a solemn convent as nuns place a statue of Jesus in front of the building. Back inside, they eat their bowls of soup in silence, with only the clanking of utensils piercing the quiet. 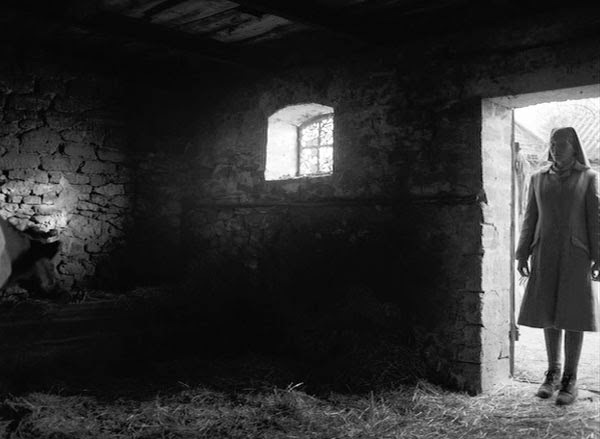 Shot in striking black and white by Lukasz Zal and Ryszard Lenczewski, the cinematography revels in the snowy bleakness. You can feel the cold air coming through the screen. It’s a striking contrast to the life of Wanda, a judge who spends her days smoking, drinking, and sleeping with random guys. Despite the comfortable accommodations, Wanda’s existence feels much drearier than the convent. She joins Anna on a road trip where both learn plenty about their family history. Anna’s parents were Jewish and forced to hide from the Nazis during the war. Her real name is Ida Lebenstein, and the quest to discover her parents’ resting place won’t be uplifting. On the other hand, it also reveals a side of life she hardly knew. Paweł Pawlikowski often places Anna on the edges of the frame. Pawlikowski (My Summer of Love) uses a 1.37:1 aspect ratio and conveys a classic feel of the time period. The black-and-white format and static camera focus our attention on the composition of each image. The camera doesn’t move until a key moment, so only the cuts change our perspective. There’s no music beyond the sounds in the story, and this choice enhances the impact of each new shot. Anna frequently stands on the edges of the frame and appears uncomfortable taking up space. She lingers away from attention and hides behind her nun’s habit. Close-ups of her face reveal beauty yet little emotion, at least for a time. 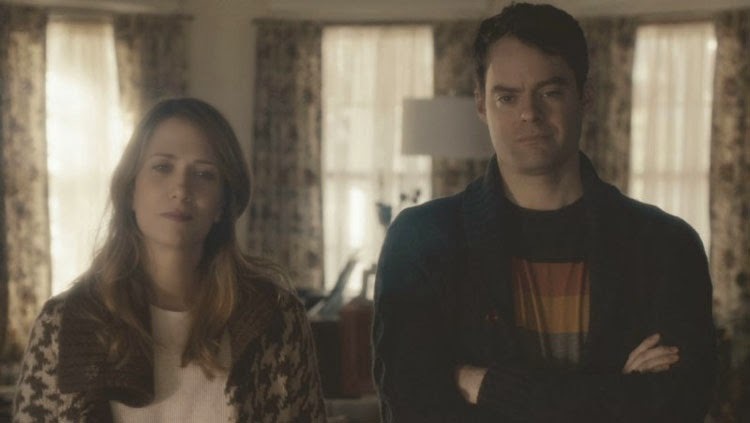 Anna’s an observer who moves slowly through life and barely injects her own feelings. You can already see the ways that she’s drifting towards the quiet lives of the older nuns. Much of the on-screen vitality comes from Agata Kulesza’s sharp performance as Wanda. She’s trying desperately to push aside terrible regret while digging into events that caused the loss. Wanda was a prosecutor in the Stalinist regime and now works as a judge. Her distant look during the courtroom proceedings reveals how little her work means. Despite pushing Anna to experience life, Wanda can barely stomach it. She’s an imposing force during their search, yet it’s often bluster. 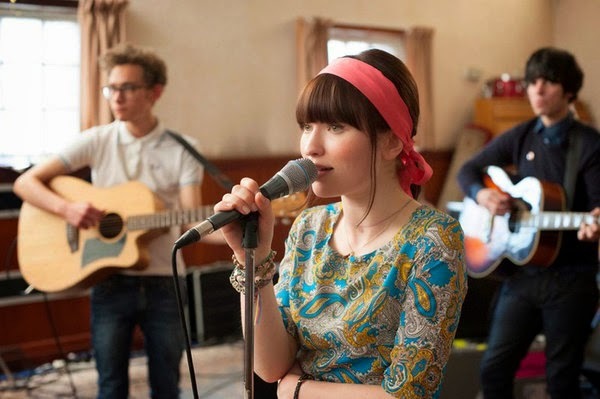 They pick up a young saxophonist named Lis who’s performing at a nearby hotel, and he brings a different vision of Poland. Anna reads the Bible in her room, yet the music downstairs is too alluring. Her quiet interest in this guy and his different world starts to reveal the young woman beneath the nun’s garb. When Anna finally removes the habit, she looks so much younger than the serious girl we’ve seen to that point. Agata Trzebuchowska's Anna discovers the wonders of jazz in Ida. 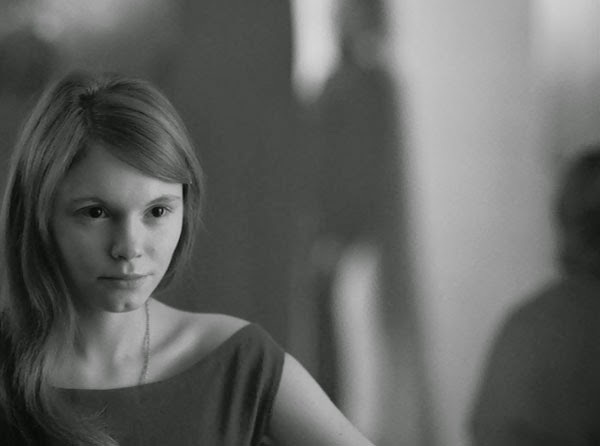 Ida is Agata Trzebuchowska’s first role, and it’s easy to see why Pawlikowski chose her. There’s a tranquil beauty to her face that fits a girl who hasn’t been worn down by sadness. Her parents connect Anna with her past, yet she has no physical memories. On the other hand, there are few positive emotions of love and happiness. The final act gives Trzebuchowska a chance to show more from Anna than her quiet demeanor. When she lets her hair down and visits a jazz club, it’s like her first day of adulthood. Dancing to Coltraine with Lis is a perfect moment, yet it’s fleeting. We see a rare smile from Anna in bed that shows forward movement, but the next steps aren’t clear. She talks of having been nowhere, and Lis gives her an opportunity. The shots of this scene are gorgeous and showcase her newfound beauty. The challenge is discovering how Anna feels about the whole experience. Is this a brief phase or an eye-opening event? The final scenes reveal her likely choice yet feel a little hollow because it’s all so sudden. Keeping her mysterious is okay, but a few more clues would have been more impactful. There’s a telling moment after Anna returns to the convent where she simply says “I’m not ready” to the statue of Jesus. This scene makes sense given what she’s experienced, but I didn’t really feel it. The minimalist approach from Pawlikowski and Co-writer Rebecca Lenkiewicz brings charm to small touches like Anna’s brief smile during the quiet meals. It’s serene but keeps us at a distance from her. There’s no separation from Wanda, and Kulesza deserves awards consideration for her confident performance. It’s easy to see the growing burden in Wanda’s every move. Despite the title, we’re just as connected with Wanda as her niece. 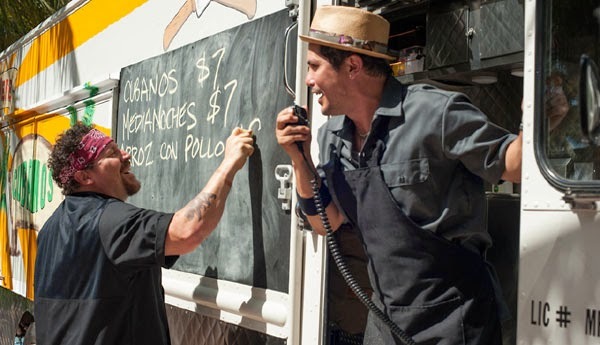 They form an interesting bond during the road trip, and there’s hope for a true friendship. Sadly, the trials of Wanda’s past remain despite the discoveries. Her terrible loss feels more present because it’s no longer repressed from her memories. When you hear about the killings from the murderer himself, it’s hard to forget them. Wanda has found closure, but a new future may be impossible. It’s difficult to understand daily life in a world filled with so much paranoia and anger. We’ve seen protests (justifiably so) here in Missouri surrounding the Michael Brown shooting, and there’s a next stage where sharp divides create a never-ending cycle. Violence is the primary method of communication, and each retaliation leads to more hatred. When you add religion to the mix, the chance for a positive solution becomes even lower. This toxic atmosphere pervades Israel in Yuval Adler’s Bethlehem, which depicts two guys on opposite sides of the conflict that have made a connection. Razi (Tsahi Halevi) is an Israeli secret service agent in Bethlehem, and he’s built a fatherly relationship with the teenage Sanfur (Shadi Mar'i). Razi’s primary goal is stopping the Al-Aqsa Martyrs Brigade, but he has a soft spot for the boy. His concern for Sanfur is an emotional blind spot that hinders Razi’s ability to bring down enemies. 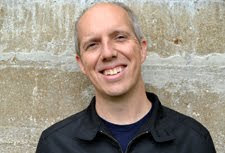 Adler presents multiple perspectives and wisely avoids setting up one character as the hero. Tsahi Halevi makes us sympathize with Razi, who wants to do the right thing. On the other hand, he risks his informants’ lives and looks for a weak spot to exploit and connect with them. He cares about Sanfur, but it isn’t just because he’s a nice guy. Razi has been pursuing Sanfur’s brother Ibrahim for a year, and this bond could pay dividends. Ibrahim is a leader responsible for suicide bombings and other attacks, so taking him out would be a major victory. On the other hand, there are plenty of lieutenants ready to step up and take their leader's place if he was taken off the game board. Ibrahim is the mouthpiece, and his face appears on a message following a suicide bombing that killed nine people. However, he needs a support network to keep attacking the Israeli system. A telling moment occurs during Razi’s recovery at the hospital from a gunshot wound. He’s casually playing backgammon with an older Arabic man, but the tone changes when the guy recognizes him as an Israeli agent. The man tells a story of a neighbor who faced dire consequences after being discovered as Razi’s informant. This ugly tale reminds us that there are ramifications to Razi’s actions. He’s doing his job and taking down enemies, but there is collateral damage. The same fate could befall Sanfur, though the boy is hardly innocent. He isn’t a hardened fighter like Badawi (Hitham Omari), but he’s trying to prove his value. His dumb bet to take a bullet while wearing a vest puts Sanfur in the hospital with shrapnel in his side. Competing with his famous brother is impossible, and his dad believes he’s worthless. Despite informing to Razi, Sanfur’s still looking for an opportunity to escape his brother’s shadow. The plot’s driving force is capturing Ibrahim, who doesn’t appear until 40 minutes into the film. The procedural aspects take over, and Razi and his associates devise a plan to stop the leader. The pursuit culminates in a tense standoff that goes sideways when a local crowd starts rioting. The camera moves inside the cramped attic while Ibrahim faces the hordes. It’s a claustrophobic moment that shows the lack of glory in Ibrahim’s fight. Even if the cops succeed, the anger towards them from local residents reminds us they’re losing the war of ideas. Killing Ibrahim will just make his partners even more dedicated. Badawi must do something big to respond, and there’s pressure from Hamas and his leaders on the next move. No one learns from a meaningless death. There’s always another enemy to capture, and there are an infinite number of targets for Al-Aqsa and Hamas. Despite the larger issues, Bethlehem is really about the relationship between Razi and Sanfur. There’s a true emotional connection that transcends the violence. Razi helps Sanfur recover from his injuries and sits by his bed like a family member. When the walls close on both of them, neither seems thrilled with betraying the other. Adler and Co-writer Ali Wakad give us multiple perspectives that expand the scope. It’s easy to sympathize with Razi or Sanfur while dreading the final outcome. Badawi’s hardened approach and frustration towards politicians like Abu Massa (Karem Shakur) also makes sense. There are no true villains, and the frustrating situation makes it difficult for residents not to join the fight. Characters stroll into diners with machine guns on their backs, and it doesn’t feel that strange. The film’s opening shot reveals teens using a town sign for target practice. They’re preparing to take their place in the conflict, and there’s little else to do at this point. There’s a fresh perspective to this story that comes from debut filmmakers. Waked is a journalist who’s spent years reporting on the conflict. This insider’s outlook keeps the screenplay from drifting into typical dramatic conflicts. Set during the second intifada in 2004-2005, the story reflects Waked’s time covering the struggle. Shooting in Jerusalem, Bethlehem, and nearby locations ensures the material feels relevant. It’s an Israeli-produced film but doesn’t convey a simplistic ideology. We can sympathize with the Palestinians’ anger towards the occupation. Adler and Waked take a procedural approach that avoids giving a one-sided view of the issues in the West Bank. The three leads are non-professional actors, and that’s remarkable given the confident performances from Halevi and Omari. They bring a quiet composure to adults that have already seen too much carnage. Razi has a solid family life with a wife and two kids, but there’s intensity behind his warm demeanor that reveals his focus. Badawi shares this fierce perspective and barely raises his voice except when absolutely necessary. Trapped in the middle of this ideological struggle is the young Sanfur, and Mar’i’s lack of acting experience shows the young man's innocence. He’s transporting money from Hamas to his brother while informing Razi about other activities. A hardened veteran would recognize that his days were numbered in this role. There’s no end in sight for this conflict, and Sanfur must choose a side or fall prey to both of them. Anyone that presents their art on the public stage has a bit of insanity in them. It takes more than talent to risk audience rejection and not lose confidence. 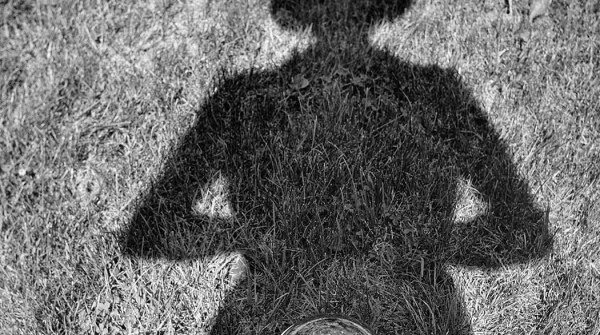 Plenty of well-known artists have struggled with mental illness. Robin Williams is a recent example of a guy who received the adulation, but it did little to save him. In the music world, performers have no leeway on the thankless stage. Chan Marshall (aka Cat Power) has a rare voice and talent, but I’ve seen firsthand what happens when a concert goes astray. In a certain way, it’s the same insecurities that deliver her best music. It’s all part of the package, and daily tensions drive the art to new heights. Would Kurt Cobain have delivered songs that we still explore today if he was a happy guy with few doubts? While there’s no clear blueprint for art, it’s hard to deny the connection between tormented geniuses and original music. 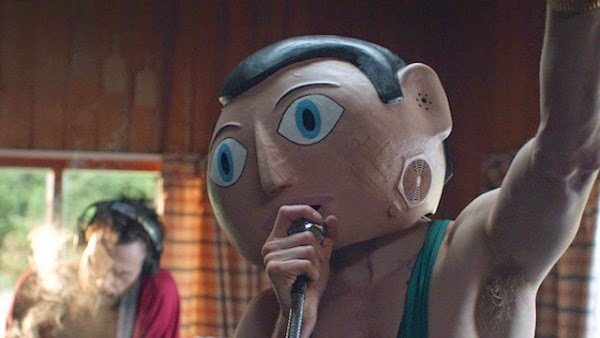 Questions of mental illness hang over Frank, which depicts an eccentric guy (Michael Fassbender) who performs with a paper-mâché mask over his head. In fact, he wears the mask all the time. Is this a piece of performance art or simply part of his being? Inspired by Frank Sidebottom — the comic alter ego of Chris Sievey — Frank never reveals anything funny about this choice. He goes to diners, performs at clubs, and just lives his life wearing the mask. 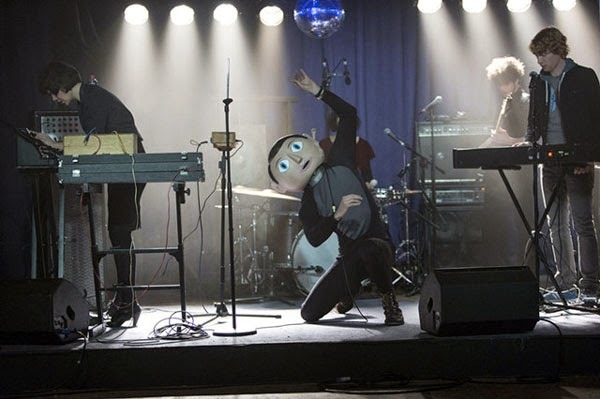 The script is co-written by Jon Ronson, who played keyboard with Sidebottom’s band in the late ‘80s. We observe the story through the eyes of Jon (Domhnall Gleeson), a young keyboardist whose experiences have some connections to Ronson’s real-life history. This mix of reality and fiction brings a strange charm to this film. We begin with Jon strolling down the streets and looking for songwriting inspirations. It quickly becomes clear that his ideas are limited in this area. When the best subject he can find is a lady’s bag, we aren’t in superstar territory. Despite having few followers for his blog and Twitter account, Jon keeps looking for an opening. I can definitely sympathize with this experience. When you’re just starting a project, any glimpse of interest is a thrilling feeling. Through pure happenstance, Jon meets Don (Scott McNairy) and gets a shot to play keyboards for the Soronprfbs. The gig is one of those unseen indie rock shows where a few curious bystanders passively observe the mess. It only lasts for a few minutes, but there’s a glimpse at something brilliant within the chaos. Watching the Soronprfbs try to record an album is something to see. Calling it a “disaster” wouldn’t go far enough. 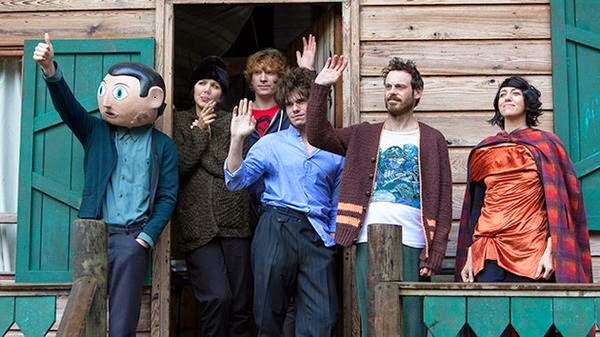 The band lives in remote cabins in Ireland and rehearses for nearly a year before they even record a note. Given some stories of bands spending years on a record, this depiction probably isn’t thar far-fetched. Our entry point is Jon, who tries to become one of them and even grows a scraggly beard. He’s the only person intrigued by the commercial prospects for such an odd group. In the world of viral videos and YouTube sensations, Frank wouldn’t be the strangest thing to build a large following. Of course, what he can actually do with that interest is a different question. The conflict between commercial and artistic success is common for bands that begin with idealistic concepts about their music. Fans want their favorite artists to get a larger following but don’t always recognize what’s connected to that growth. The Goo Goo Dolls toiled for years in clubs and were an energetic (if fairly simple) live act. When they finally made it big, they morphed into something unrecognizable and entirely forgettable. While this fate isn’t likely for Frank, he can’t help but get excited when Jon nabs the Soronprfbs a slot at South by Southwest. Playing for people that actually know them at such a grand event sounds amazing. The danger is stretching too far and inviting destruction. Michael Fassbender is well-known for big-budget productions like the X-Men films and Prometheus. He might seem out of place in Frank, but that isn’t really the case. Looking at Fassbender’s career, he’s thrived in unconventional parts in films like Shame and Hunger. Frank is different than those guys yet equally challenging. It’s thrilling to watch Fassbender hide behind a mask and continue to stretch his talents. Despite the visual barrier, Frank is a unique character who isn’t a gimmick. When we see his real face in the end, the moment feels earned and delivers a powerful conclusion. It doesn’t really explain the mask yet provides enough to make it understandable. 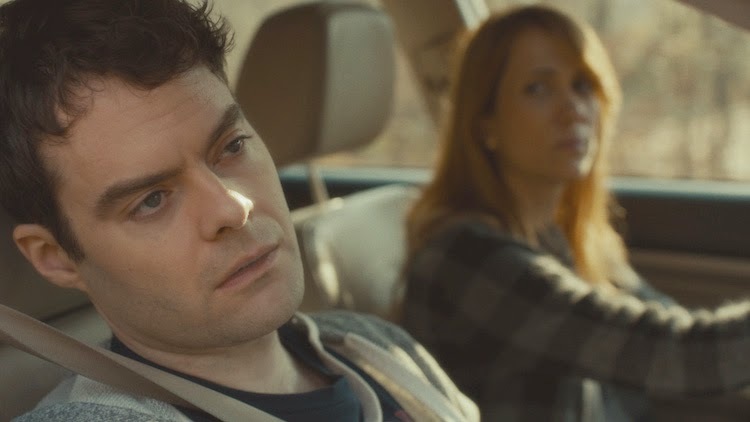 There’s a deft mix of comedy and tragedy within Frank, and it doesn’t always connect. Jon is such a dummy, yet we’re stuck with his perspective. His bandmates are standoffish, particularly Maggie Gyllenhaal’s Clara. They have little interest in commercial success and recognize the danger from Jon that Frank doesn’t see. 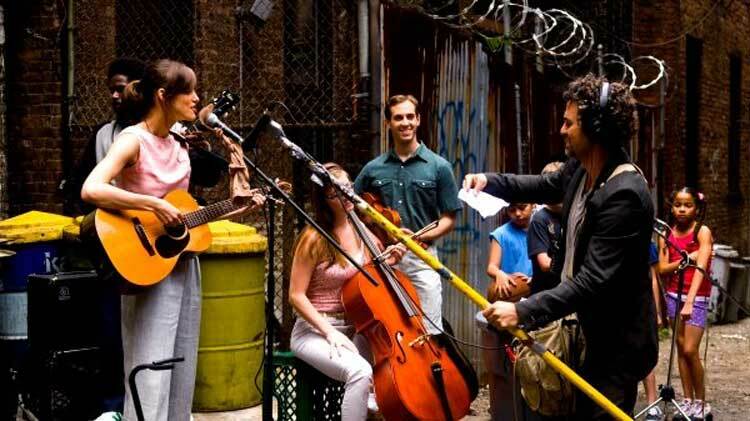 There’s a risk for the filmmakers to create too much distance or make fun of the band. Neither really happens here, and that’s the reason the movie works. When the challenges arrive in Texas, there’s the risk the story will go off the rails. There are so many ways to go wrong, yet Director Lenny Abrahamson sidesteps nearly all of them. It’s an offbeat tale that won’t offer an easy conclusion, and leaving the characters in their rightful places is no easy feat. The music is surprisingly brief throughout most of the film. We catch glimpses of rehearsals, or something frequently goes wrong to stop the momentum. The exception is the finale, which reveals the rare power that emanates from Frank’s mind. “I Love You All” is an incredible song that closes the movie on just the right note. Despite the artistic success, the band isn’t heading for stardom. Even so, they’re collaborating on the fly and building remarkable music. Frank’s powerful voice sounds clearer than ever, and we really hear him for the first time. The story closes on just the right note and reveals their strength as a unit, no matter what obstacles arrive down the road. It’s been interesting to watch how the second phase of Marvel films has moved into more distinctive genres. The first installments created the universe and introduced us to familiar super heroes like Thor, Captain America, and Iron Man. This world-building was important to the success of The Avengers because we knew the main characters. For Phase 2, the heroes could live more in their natural environments. Thor: The Dark World ventured into fantasy territory with dark elves, stone aliens, and more otherworldly beings. Iron Man 3 focused on Tony Stark and seemed bored with the robot fights. The game changer for Marvel this summer was Guardians of the Galaxy, which proved that you didn’t need household names to draw crowds. Tucked in the middle was a conspiracy thriller that cranked up the paranoia and packed a punch. Captain America: The Winter Soldier arrived in April and delivered an engaging mix of suspense and charm that exceeded the genre. 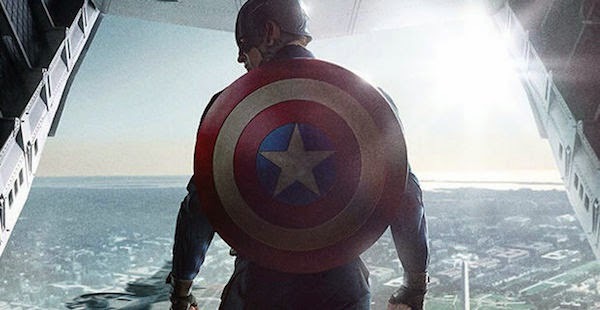 What’s surprising is how engaging Chris Evans is as Captain America. He brought heart to the role in The First Avenger, but I didn’t expect him to work this well. Evans’ career includes an early performance as the Human Torch in the unfortunate Fantastic Four films and as a man with special abilities in Push. 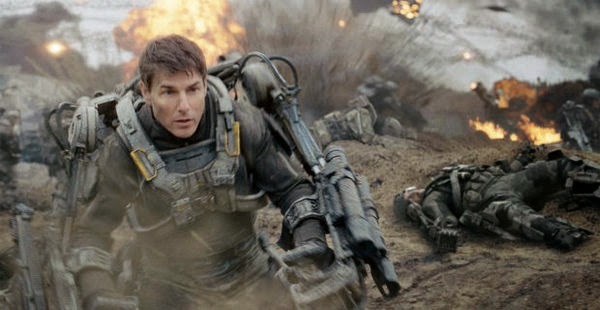 He’s comfortable within a big action film and makes the stunts believable. 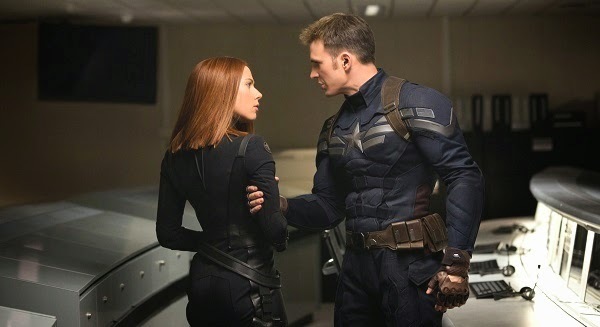 He’s also grown into the kind of guy who can sell the smaller moments, particularly with Scarlett Johansson’s Black Widow. They spend the second act on the run in a story that wouldn’t feel that out of place in a Hitchcock film. Thankfully, there’s no romance to sidetrack the plot. Evans makes it easy to root for the hero, who recognizes shady justifications from his own government. The bureaucrats have drawn the wrong conclusions from recent crises, and evil schemes lurk behind the scenes. An obvious connection to ‘70s films like Three Days of the Condor and All the President’s Men is Robert Redford as Alexander Pierce. He brings immediate weight as a government official who doesn’t share the love for Captain America. It’s clear that he’s hiding something, and Redford’s scraggly face presents a guy who’s won his share of battles. Samuel Jackson gets a larger role as Nick Fury and thrives in it. 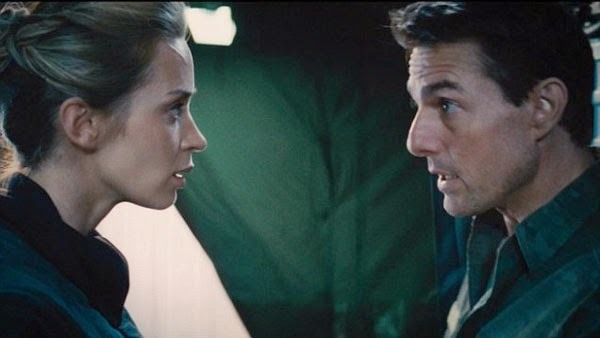 Despite the lack of alien invaders or monsters in this film, you get the sense that the stakes are even higher. The menace comes from within our own systems, and fighting it may be impossible. I’ve yet to mention the Winter Soldier (Sebastian Stan), an assassin who ensures the enemy’s success. He’s a flipside of the coin from Captain America and has become a deadly weapon through genetic enhancements. Their hand-to-hand fights are more down-to-earth and have added relevance because they were best friends during World War II. This film helped to dramatically improve Agents of S.H.I.E.L.D. 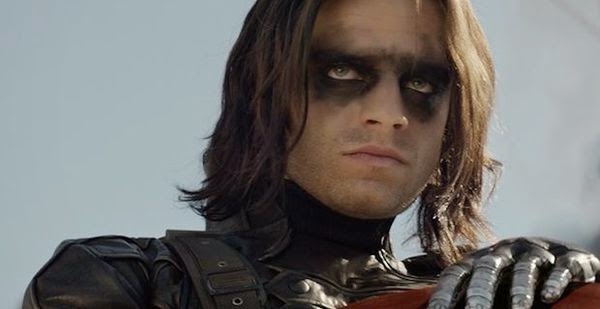 That show was floundering creatively, and its connection with The Winter Soldier led to a stunning turnaround. 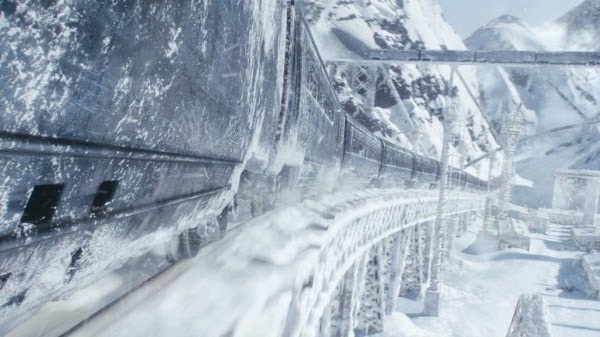 Instead of making a few minor references, the series occurred simultaneously with the movie’s timeline, and it was a big surprise. I saw the Agents of S.H.I.E.L.D. episodes before this film, and it spoiled plot points yet failed to diminish my enjoyment. It’s been interesting to watch the show act as a sequel and continue the Hydra story line into its second season. Captain America may stop the villains in the movie, but the struggle is far from over. I love the idea of an ongoing story that drifts from movies to television and remains interesting. If there’s any way to get Chris Evans to drop onto the small screen, it would be worth the effort to maintain the momentum. 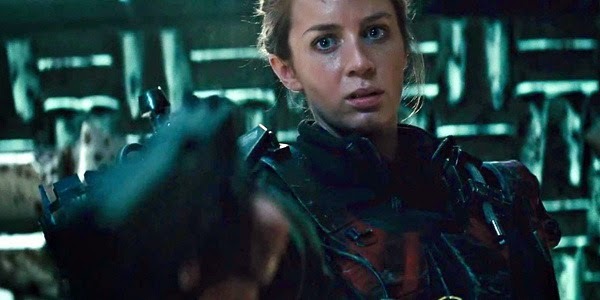 The Winter Soldier was directed by Anthony and Joe Russo, who’d made their name on shows like Community after directing Welcome to Collinwood and You, Me, and Dupree. They craft a world that has giant airships yet relies more on practical effects. A standout moment takes Captain America and Black Widow into an old S.H.I.E.L.D. bunker in New Jersey to face off with an evil computer. The set design recalls an analog era of giant computers hidden away in underground sites. It’s a clever moment that springs from an old spy serial with the consciousness of a villainous German doctor (Toby Jones) predicting their doom. The stakes are high, but there’s a sense of fun about this adventure. We aren’t living in Man of Steel or AS2 territory in this thriller. Our heroes are constantly on the run from all types of bad guys, and discovering whom to trust is a consistent challenge. One friend is Sam Wilson, who’s revealed as the Falcon thanks to high-tech military weapons. Anthony Mackie seems more comfortable than Don Cheadle playing a sidekick in the comic book world. The cast looks energized by getting more material than staring at a green screen. It plays to the strengths of guys like Redford and Jackson to get long monologues as all is revealed. Marvel’s had a remarkable year, especially because many looked past The Winter Soldier and Guardians of the Galaxy to The Avengers: Age of Ultron. It will take a a lot to surpass these films, which rank among the most entertaining releases of 2014. They’re different yet recall the best aspects of the summer movie season. Despite its April release, this film deserves that label and is one of the better recent blockbusters. I’m intrigued to see where Captain America will go in a third film.